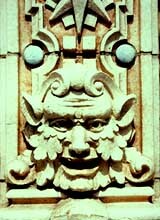 Glazed architectural terra-cotta was significant in the development of important architectural idioms in this country—specifically, the "Chicago School," the High Rise and the Historic or Beaux Arts styles. In fact, glazed architectural terra-cotta is one of the most prevalent masonry building materials found in the urban environment today. Popular between the late 19th century and the 1930s, glazed architectural terra-cotta offered a modular, varied and relatively inexpensive approach to wall and floor construction. It was particularly adaptable to vigorous and rich ornamental detailing. However, with changing vogues in materials and architectural styles and rising production costs, glazed architectural terra-cotta fell into disfavor and disuse by the mid 20th century. Today, information on the maintenance, rehabilitation and replacement of glazed architectural terra-cotta is limited, as are sources of new glazed architectural terra-cotta. This report, then, will discuss some of the major deterioration problems that commonly occur in historic glazed architectural terra-cotta, methods of determining the extent of that deterioration and recommendations for the maintenance, repair and replacement of the deteriorated historic material. What is Terra-Cotta? Generically, the broadest definition of terra-cotta refers to a high grade of weathered or aged clay which, when mixed with sand or with pulverized fired clay, can be molded and fired at high temperatures to a hardness and compactness not obtainable with brick. Simply put, terra-cotta is an enriched molded clay brick or block. The word terra-cotta is derived from the Latin word terra-cotta—literally, "cooked earth." terra-cotta clays vary widely in color according to geography and types, ranging from red and brown to white. Glazed architectural terra-cotta was the most complex development of terra-cotta as a masonry building material in this country. The hollow units were hand cast in molds or carved in clay and heavily glazed (often in imitation of stone) and fired. Sometimes called "architectural ceramics," glazed architectural terra-cotta was developed and refined throughout the first third of the 20th century and has been closely associated with the architecture of Cass Gilbert, Louis Sullivan, and Daniel H. Burnham, among others. Significant examples in this country include the Woolworth Building (1913) in New York City and the Wrigley Building (1921) in Chicago. Late 19th and early 20th century advertising promoted the durable, impervious and adaptable nature of glazed architectural terra-cotta. It provided for crisp, vigorous modeling of architectural details as the molds were cast directly from clay prototypes without loss of refinement. Glazed architectural terra-cotta could accommodate subtle nuances of modeling, texture and color. Compared to stone, it was easier to handle, quickly set and more affordable to use. Thought to be fireproof and waterproof, it was readily adaptable to structures of almost any height. The cost of molding the clay, glazing and firing the blocks, when compared to carving stone, represented a considerable savings, especially when casts were used in a modular fashion—that is, repeated over and over again. Maintenance of the fired and glazed surface was easy; it never needed paint and periodic washings restored its original appearance. Glazed architectural terra-cotta probably comprises one of the largest if not the largest constituent material in some of our urban environments today. However, the infinite varieties of glazing have hidden this fact from the casual observer. One of the attractive features of glazed architectural terra-cotta in its time was that it could be finished (glazed) in exact imitation of stone. In fact, many building owners and architects alike are often surprised to discover that what they presumed to be a granite or limestone building is glazed architectural terra-cotta instead. Typical construction detail of glazed architectural terra-cotta ornament. Drawing: Detail, Architectural Terra Cotta, Charles E. White, Jr., 1920. Historically, glazed architectural terra-cotta has been used in association with two specific and very different types of building systems: as part of a traditional load-bearing masonry wall in buildings of modest height, and as a cladding material in High Rise construction. As cladding, glazed architectural terra-cotta often utilized an extensive metal anchoring system to attach it or to "hang it" onto a wall framing system or superstructure. In the first instance the anchoring was limited; in the second, the anchoring was often extensive and complex. Likewise, in the first instance, deterioration has generally been limited. However, where glazed architectural terra-cotta was used as cladding, particularly in high rise construction, present-day deterioration and failure are often severe. Deterioration is, by nature of the design, infinitely complex—particularly when glazed architectural terra-cotta has been used as a cladding material. Deterioration creates a "domino"like breakdown of the whole system: glazed units, mortar, metal anchors, and masonry backfill. In no other masonry system is material failure potentially so complicated. 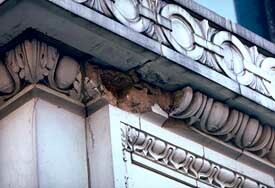 The root of deterioration in glazed architectural terra-cotta systems often lies in a misapplication of the material. Historically, glazed architectural terra-cotta was viewed as a highly waterproof system needing neither flashing, weep holes nor drips. This supposition, however, has proved to be untrue, as serious water-related failure was evident early in the life of many glazed architectural terra-cotta clad or detailed buildings. As with most building conservation and rehabilitation problems, water is a principal source of deterioration in glazed architectural terra-cotta. Terra-cotta systems are highly susceptible to such complex water-related deterioration problems as glaze crazing, glaze spalling and material loss, missing masonry units and deteriorated metal anchoring, among others. Water and air-borne moisture entering the glazed architectural terra-cotta causes expansion of the porous clay body, increasing its volume. This upsets the "fit" of the glaze and makes its surface shatter, which is commonly called "crazing." Photo: NPS files. 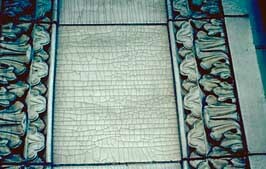 Crazing, or the formation of small random cracks in the glaze, is a common form of water-related deterioration in glazed architectural terra-cotta. When the new terra-cotta unit first comes from the kiln after firing, it has shrunken (dried) to its smallest possible size. With the passage of time, however, it expands as it absorbs moisture from the air, a process which may continue for many years. The glaze then goes into tension because it has a lesser capacity for expansion than the porous tile body; it no longer "fits" the expanding unit onto which it was originally fired. If the strength of the glaze is exceeded, it will crack (craze). Crazing is a process not unlike the random hairline cracking on the surface of an old oil painting. Both may occur as a normal process in the aging of the material. Unless the cracks visibly extend into the porous tile body beneath the glaze, crazing should not be regarded as highly serious material failure. It does, however, tend to increase the water absorption capability of the glazed architectural terra-cotta unit. Spalling, the partial loss of the masonry material itself, is, like crazing, caused by water and is usually a result not only of airborne water but more commonly of water trapped within the masonry system itself. Trapped water is often caused by poor water detailing in the original design, insufficient maintenance, rising damp or a leaking roof. In most cases, trapped water tends to migrate outward through masonry walls where it eventually evaporates. In glazed architectural terra-cotta, the water is impeded in its journey by the relatively impervious glaze on the surface of the unit which acts as a water barrier. The water is stopped at the glaze until it builds up sufficient pressure (particularly in the presence of widely fluctuating temperatures) to pop off sections of the glaze (glaze spalling) or to cause the wholesale destruction of portions of the glazed architectural terra-cotta unit itself (material spalling). Blistering of the glaze, like crazing, is the result of the increase in water in the porous clay body and the subsequent destruction of the glaze as a result of water migration and pressure. 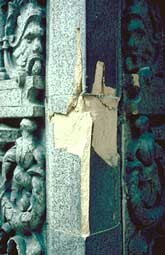 Glaze spalling may also be caused by deterioratoin of metal anchors behind the terra-cotta unit. Photo: NPS files. 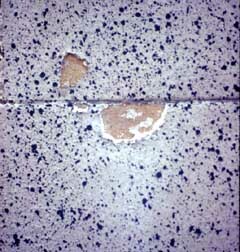 Glaze spalling (left) may appear as small coin-size blisters where the glaze has ruptured and exposed the porous tile body beneath. This may occur as several spots on the surface or, in more advanced cases of deterioration, it may result in the wholesale disappearance of the glaze. Spalling of the glaze may also be symptomatic of deterioration (rusting) of the internal metal anchoring system which holds the terra-cotta units together and to the larger building structure. The increase in volume of the metal created by rusting creates increased internal pressures in the terra-cotta unit which, in turn, may spall the glaze, or in more extreme cases, cause material spalling. Material spalling is a particularly severe situation. Not only is the visual integrity of the detailing impaired, but a large area of the porous underbody, webbing and metal anchoring is exposed to the destructive effects of further water entry and deterioration. Both glaze and material spalling must be dealt with as soon as possible. Missing units is a serious situation which particularly plagues architectural terra-cotta systems. Unlike brick or stone, damaged glazed architectural terra-cotta is exceedingly difficult to replace. New production is extremely limited. Missing units create gaps which increase the structural load on the remaining pieces and also permit water to enter the system. 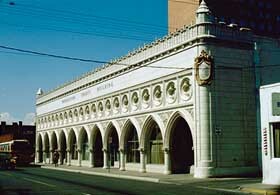 Exposed or freestanding glazed architectural terra-cotta detailing (balusters, urns, parapet walls, etc.) are particularly susceptible to extensive loss of material. Deteriorated anchoring systems are perhaps the most difficult form of glazed architectural terra-cotta deterioration to locate or diagnose. Often, the damage must be severe and irreparable before it is noticed on even the most intense "prima facie" examination. Water which enters the glazed architectural terra-cotta system can rust the anchoring system and substantially weaken or completely disintegrate those elements. Where water has been permitted to enter the system, some deterioration has more than likely taken place. Partial deterioration results in staining and material spalling. Total deterioration and the lack of any anchoring system may result in the loosening of the units themselves, threatening the architectural or structural integrity of the building. Recently, falling glazed architectural terra-cotta units have become a serious safety concern to many building owners and municipal governments. Early detection of failing anchoring systems is exceedingly difficult. Deteriorated mortar has always been a key to the survival or failure of any masonry system. This is particularly true with glazed architectural terra-cotta. In recognition of the fragile nature of the system, the need for insuring a relatively dry internal system is important. Sound mortar is the "first line" of defense in terra-cotta systems. It is a maintenance "must." Deteriorated mortar joints are a singularly culpable source of water and, therefore, of deterioration. Mortar deterioration may result from improper original craftsmanship or air—and waterborne—pollution. More often, however, lack of ongoing maintenance is mainly responsible. Deteriorated mortar should not be overlooked as a major source of glazed architectural terra-cotta failure. Stress-related deterioration of glazed architectural terra-cotta frequently occurs in high rise buildings. The evolution of stress relieving details (flexible joints, shelf angles, etc.) occurred late in the development of American building construction. Consequently, most early continuously clad High Rise buildings (c.1900-1920s) had little or no provisions for normal material and building movement in their original design. Inappropriate repairs result because using new terra-cotta for replacement of deteriorated or missing glazed architectural terra-cotta has generally been impractical. Repairs, therefore, have traditionally been made in brick or cementitious build ups of numerous materials such as stucco or fiberglass. Some materials are appropriate temporary or permanent replacements, while others are not. (These issues are discussed at a later point in this report.) However, improper anchoring or bonding of the repair work or visual incompatibility of repairs have themselves, with the passage of time, become rehabilitation problems: replacement brick that is pulling free, cement stucco that is cracking and spalling, or a cement or bituminous repairs that are not visually compatible with the original material. Alteration damage has occurred as a result of the installation of such building additions as signs, screens, marquees or bird proofing. These installations often necessitated the boring of holes or cutting of the glazed architectural terra-cotta to anchor these additions to the building frame beneath. As the anchoring or caulking deteriorated, or as these elements were removed in subsequent renovation work, these holes have become significant sources of water-related damage to the glazed architectural terra-cotta system. Certain deterioration in glazed architectural terra-cotta may be on the building surface and patently obvious to the casual observer—crazing, spalling, deterioration of mortar joints. Other deterioration may be internal or within the masonry system and hard to determine—deterioration of anchoring, deterioration behind the glaze, crumbling of internal webbing. Prima facie, "first inspection," examination may indicate surface deterioration problems while not revealing others. This demonstrates one of the most frustrating aspects of dealing with deteriorated glazed architectural terra-cotta: that there are two systems or levels of deterioration, one which is visible and the other which is not. Before a terra-cotta building is analyzed for deterioration, it is often advisable, but not always necessary, to clean the surface of the material. This is particularly true when the material has been exposed to the vicissitudes of heavy urban pollution. While most building materials are cleaned for "cosmetic" purposes, the cleaning of glazed architectural terra-cotta for the purpose of inspection and analysis may be advised. Dirt on glazed architectural terra-cotta often hides a multitude of problems. It is only with cleaning that these problems become obvious. Recommended cleaning procedures are covered later in the report. Prima facie analysis is the unit by unit, firsthand, external inspection of the glazed architectural terra-cotta building surface. Special note of all visible surface deterioration (staining, crazing, spalling, cracking, etc.) should be made on elevation drawings. Binoculars are often used where cost, height, or inaccessibility prevent easy inspection. However, much deterioration may go unnoticed unless scaffolding or window-washing apparatus is used in a true "hands on" inspection of each unit of the facade. Infrared scanning is only in the experimental stage at this time, but its use seems to hold great promise in locating deteriorated internal material in terra-cotta. All materials emit heat—heat which can be measured in terms of infrared light. While infrared light cannot be seen by the human eye, it can be measured by infrared scanning. Infrared photography, a kind of infrared scanning, has been of particular use in detecting sources of heat loss in buildings in recent years. Broken or loose internal terra-cotta pieces have a less firm attachment to the surrounding firm or attached pieces and, therefore, have different thermal properties, i.e., temperatures. These temperature differences become evident on the infrared scan and may serve as a fair indication of internal material deterioration in terra-cotta. Exposed or freestanding terra-cotta detailing (parapets, urns, balusters, etc.) have traditionally been subjected to the most severe vicissitudes of deterioration as a result of freezing temperatures and water. Photo: NPS files. Deterioration in glazed architectural terra-cotta is, by definition, insidious in that the outward signs of decay do not always indicate the more serious problems within. It is, therefore, of paramount importance that the repair and replacement of deteriorated glazed architectural terra-cotta not be undertaken unless the causes of that deterioration have been determined and repaired. As mentioned before, one of the primary agents of deterioration in glazed architectural terra-cotta is water. Therefore, water-related damage can be repaired only when the sources of that water have been eliminated. Repointing, caulking and replacement of missing masonry pieces are also of primary concern. Where detailing to conduct water in the original design has been insufficient, the installation of new flashing or weep holes might be considered. The successful cleaning of glazed architectural terra-cotta removes excessive soil from the glazed surface without damaging the masonry unit itself. Of the many cleaning materials available, the most widely recommended are water, detergent, and a natural or nylon bristle brush. More stubborn pollution or fire-related dirt or bird droppings can be cleaned with steam or weak solutions of muriatic or oxalic acid. The covering of crazed glazing with waterproof coatings is the subject of an ongoing controversy today. The question involves whether or not the micro-cracks conduct substantial amounts of water into the porous tile body. Tests indicate that the glaze on new unexposed terra-cotta is itself not completely waterproof. Some testing also indicates that most crazing on historic glazed terra-cotta does not substantially increase the flow of moisture into the porous tile body when compared to new material. Excessive and serious crazing is, however, an exception and the coating of those areas on a limited scale may be wholly appropriate. 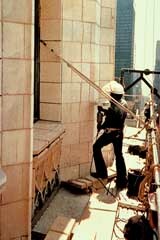 A worker cleans out mortar joints in preparation for repointing the architectural terra-cotta Photo: NPS files. Repointing of mortar which is severely deteriorated or improperly or infrequently maintained is one of the most useful preservation activities that can be performed on historic glazed architectural terra-cotta buildings. Ongoing and cyclical repointing guarantees the long life of this material. Repointing should always be carried out with a mortar which has a compressive strength (measured in p.s.i.) lower than the adjacent masonry unit. Hard (Portland cement) or coarsely screened mortars may cause point loading and/or prevent the outward migration of the water through the mortar joints, both of which ultimately damage the terra-cotta unit. Repointing with waterproof caulking compounds or similar waterproof materials should never be undertaken because, like waterproof coatings, they impede the normal outward migration of moisture through the masonry joints. Moisture then may build sufficient pressure behind the waterproof caulk and the glaze on the terra-cotta to cause damage to the unit itself. Glaze spalling is also a highly culpable source of water-related deterioration in glazed architectural terra-cotta. It is important to coat or seal these blistered areas and to prevent further entry of water into the system by this route. All loose or friable material should be removed. This may be done easily by hand; chisels or similar small tools are most effective. The exposed material is then painted over. At this time, no permanently effective reglazing materials are available. However, there are several acrylic-based proprietary products and masonry paints which can be used effectively to protect these exposed areas, thus preventing the entry of water. These materials are effective for 5 to 7 years and can be reapplied. They also can be tinted to approximate closely the original glaze color. Minor material spalling, where visual or cosmetic considerations are negligible, should be treated in a manner similar to glaze spalling damage. That is, areas where small portions of the body and glaze have spalled and which are far removed from close scrutiny (i.e., detailing on entablatures, upper story windows, etc.) are best remedied by painting with a masonry paint or an acrylic-based proprietary product. Units on which material spalling is easily observed (on the street level, door surrounds, etc. ), and on which visual integrity is a consideration, may be better replaced. Patching is not appropriate. 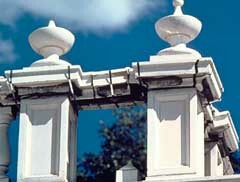 Stucco-like or cementitious buildups are difficult to form satisfactorily, safely and compatibly in situ to replace missing pieces of glazed architectural terra-cotta. Cementitious repairs never satisfactorily bond to the original material. The differential expansion coefficients of the two materials (the repair and the original) preclude a safe, effective and long-term attachment. Glazed architectural terra-cotta units, which have spalled severely thereby losing much of their material and structural integrity in the wall, should be replaced. Partial in situ repair will not be long lasting and may, in fact, cause complicated restoration problems at a later date. Appropriate methods of replacement are discussed at a later point in this report. Stabilization measures are necessary when deterioration is so severe as to create a situation where pieces of glazed architectural terra-cotta may fall from the building. This is a particular concern with greatly exposed detailing: cornices, balconies, balustrades, urns, columns, buttresses, etc. Restoration work on these pieces is expensive and often must be carried on over a period of time. Unstable terra-cotta pieces are often removed or destroyed in lieu of such measures. This is particularly true in areas of heavy traffic-related vibrations or in earthquake zones. There are, however, less severe measures which may be employed on a temporary basis. Substantial success has been achieved in securing unstable glazed architectural terra-cotta pieces with metal strapping and nylon net. While these measures should not be seen as permanent preservation solutions, they do offer temporary alternatives to the wanton destruction of significant glazed architectural terra-cotta detailing in the name of public safety and local code compliance. This crack is being measured. Structural cracking, whether static (nonmoving) or dynamic (moving) should be caulked to prevent water entry into the glazed architectural terra-cotta system. Photo: NPS files. Holes, sign anchors, slots for channel steel, or structural cracking in the surface of glazed architectural terra-cotta cladding should be permanently sealed with a material that will expand with the normal dynamics of the surrounding material, yet effectively keep water out of the system. Any one of a number of commercially available waterproof caulking compounds would be appropriate for this work. Holes and static (non-moving) cracks may be caulked with butyl sealants or acrylic latex caulks. For dynamic (moving or active) cracks, the polysulfide caulks are most often used, although others may be safely employed. It is, however, important to remember that these waterproof caulking compounds are not viable repointing materials and should not be used as such. Temporary replacement measures should be implemented when missing units are scheduled to be replaced but work cannot be undertaken immediately. Lengthy delivery time, prorating of work or seasonal considerations may postpone replacement work. Severe deterioration should at least be ameliorated until work can begin. Temporary repointing, removal and saving of undamaged units to be reset later, or the temporary installation of brick infill to retard further deterioration might be considered. Removing earlier repairs may be necessary when the work has either deteriorated or has become visually incompatible. Cementitious stucco, caulkings with black bituminous compounds or brick repair work may become structurally or visually unstable or incompatible and should be removed and properly rehabilitated. Replacement of severely spalled, damaged, or missing glazed architectural terra-cotta elements is always difficult. Certainly, in-kind replacement is advisable, but it has a number of drawbacks. Stone, fiberglass, and precast concrete are also viable choices, but like in-kind replacement, also have their inherent problems. Precast concrete units show great promise in replacing glazed architectural terra-cotta at this writing. Precast concrete units can, like fiberglass, replicate nuances of detail in a modular fashion: they can also be cast hollow, use lightweight aggregate and be made to accommodate metal anchoring when necessary. Concrete can be colored or tinted to match the original material with excellent results. It is cost effective and once production is in process, precast concrete call be produced quickly and easily. 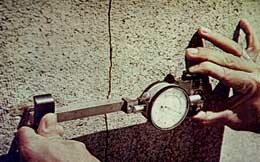 Experience shows that it is advisable to use a clear masonry coating on the weather face of the precast concrete units to guarantee the visual compatibility of the new unit, to prevent moisture absorption, to obtain the proper reflectivity in imitation of the original glaze and to prevent weathering of the unit itself. Precast concrete replacement units are presently enjoying great use in replicating historic glazed architectural terra-cotta and show promise for future rehabilitation programs. Once the replacement material is selected (new glazed architectural terra-cotta. 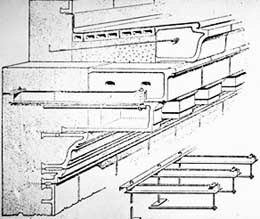 stone, precast concrete, or fiberglass), it must be reanchored into the masonry system. Original metal anchoring came in numerous designs, materials and coatings ranging from bituminous-coated iron to bronze. While most of these anchors are no longer available, they may be easily replicated in large quantities either in the original material when appropriate or out of more durable and available metals such as stainless steel. This Preservation Brief was written by de Teel Patterson Tiller, Architectural Historian, Technical Preservation Services Division. Information for this publication was based in part upon interviews and consultation with Theodore H.M. Prudon, The Ehrenkrantz Group, P.C., New York, New York. Additional comments and information were provided by Si A. Bortz, Illinois Institute of Technology Research Institute, Chicago, Illinois, and Jerry G. Stockbridge, Wiss, Janney, Elstner, and Associates, Northbrook, Illinois.